All day long (from 6:00am to 5:00pm), we cover many kilometres across several areas to collection provisions. 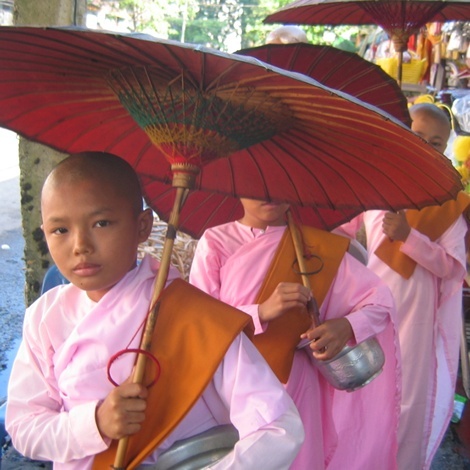 As you can see it on the pictures we leave with just an aluminium pot in which we receive our offerings and a parasol to protect us from the sun, because in Burma it beats down very hard. We collect provisions only two days a week. 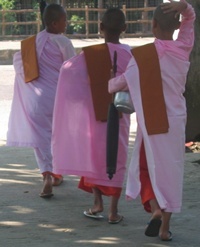 To avoid abuses, the nuns are allowed to do that two days before the full moon days, the new moon days and the rising or coming down half moon. That is almost twice a week. 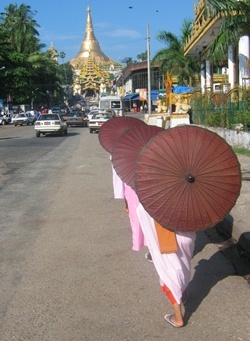 As there are a lot of nuns in the district we have to do a long walk, some times by bus because people who live here cannot give offerings to everyone. 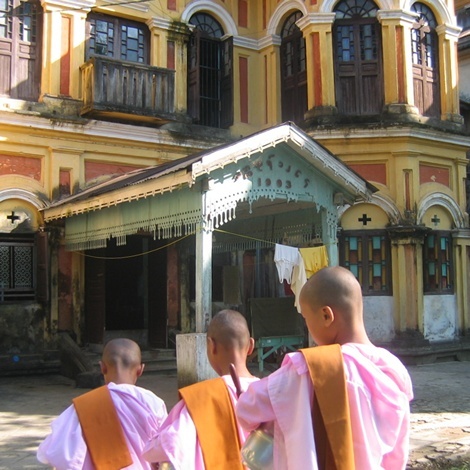 In addition to the nuns there are also a lot of monks and novices. 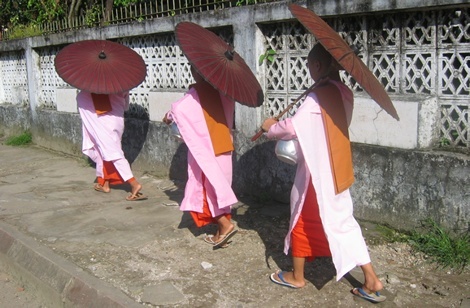 Contrary to monks and novices we are allowed to accept money, walk with sandals and shelter under an umbrella. 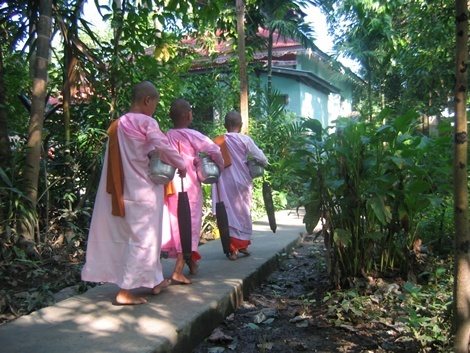 On the other hand, as anyone we have to take our shoes off each time we are within a monastery, on the platform of a cetiya (pagoda) or if we come into people’s home. 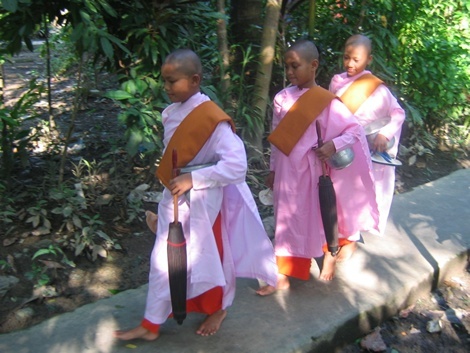 The brown cloth we wear on our shoulder is used for covering our chest. Even if it is more useful to our elders we practice to use it whatever is our age. We always hope having a good harvesting because this must last the whole of the week. Each time we see an open house, a market or a shop we stop in front of it, reciting wellbeing wishes for those who hear us. We act like this in the districts where we used to do our collection, but also all along the way. Reciting out loud brings attention on us. 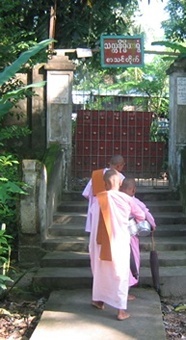 It is another advantage we have upon the monks who must be completely silent when they do their collection. Furthermore they can do it only for the morning. 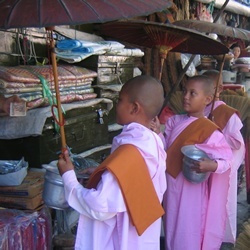 On the other hand compared with us the benefit they have is that they can do their collection every morning and that people are inclined to make them more offerings because they follow more discipline rules than we do. In any case, we are glad about being girls because it would tire us walking so far every day. Moreover we think that the town is really too noisy. Generally, people prepare in advance what they will give to the nuns because they know the days in which we do the collection. As much as they get something, they give it to us pouring it in our aluminium container. It is sometimes the inhabitants or the traders that give us offerings and sometimes people who go shopping or who are only passing on. Anyway, people give us respectfully because they know we have a virtuous life and they are very glad like this to grab the chance to give themselves merit. Most of time it is given to us raw rice or money. But we also receive fruits, vegetables, oil, sweets or cleaning products as washing powder, soap or toothpaste. 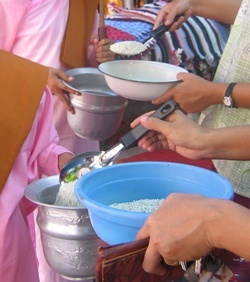 Unlike us, the monks, are not allowed to cook or to use money, so they are given cooked rice and food already cooked. 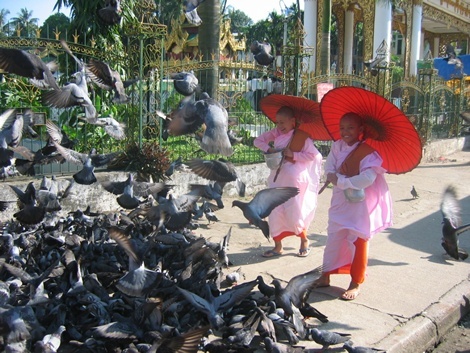 Sometimes we like giving some rice to the pigeons. It is an opportunity for us to make a good deed and being delighted at the sight the birds give us. ...our little quiet space, in the shade of the coconut trees and the banana trees and sheltered from the noisy city.